CLI (Command Line Interface) tool is very handy! To solve this challenge, many CLI tools are available nowadays to reduce your groundwork. For Angular, Angular CLI is available and it creates a skeleton with referencing necessary dependencies. This allows you to get started with Angular development within 5 minutes. In order to use Ignite UI CLI, you need to install the followings to your environment. Open terminal or console and type following command to install Ignite UI CLI. You may need to run this as Administrator in some cases. After completing the install, you can check the version with the following command. If Ignite UI CLI is installed, you will see this screen. I am using Ignite UI CLI 1.2.0-beta.1 for this entry. If you type "ig -h", you will see available commands, but I recommend using our guide, which prompts you for options and you can select them by using cursor keys. To start Ignite UI with the guide, simply type the following command. When the guide starts, first you will enter a project name you will be working on. Ignite UI CLI currently provides 3 options to choose for the framework you are going to use. Angular, jQuery, React. In this entry, I choose Angular. After choosing the type of project, the structure of the project has been generated and now you can choose the component (a view with single control) or view (a view with multiple components generated from templates) repeatedly. When you select to Add component, You will choose a group of components, then choose component to be placed. The latest Ignite UI CLI provides 3 groups, Layouts, Scheduling, Grids&Lists. In this entry, I chose Grids&Lists group then, added a Grid. The name of added component is "myGrid". When you select add View, you can add a view provided by Infragistics. Views represent specific business scenarios and look like more completed. When you choose complete, Build process gets kicked and after completion, you can open a browser to localhost's address specified in the terminal. Links on the side bar navigate you to pages generated by Ignite UI CLI. How to run an existing project created by Ignite UI CLI? If you receive or download a project, which was generated by Ignite UI CLI, you can run the project by using the following command in the project folder/directory. Build starts automatically then project starts. If you want to add components or views, simply type "ig" in the project folder/directory. 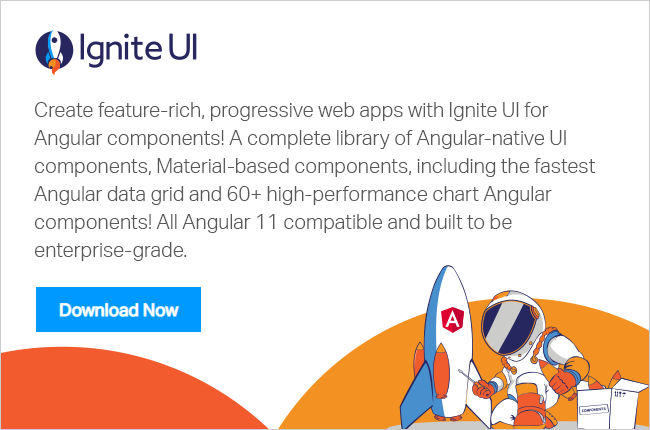 Ignite UI CLI has been built to jump start using Ignite UI libraries. You can use this tool to learn how to use our libraries and also you can extend generated views to match your business needs. If you would like to know more detail about Ignite UI CLI or would like to see the source code, you can visit our GitHub page.